Happy 2012! I have some fun cooking goals this year and one of them includes sharing more recipes. To do this I signed up for a 52 week cooking (and baking) challenge so I will have at least two new recipes to share each week. As part of this challenge we are given a theme each week. The cooking theme was eggs and the baking theme was brownies. I knew I wanted to make an egg recipe I’ve never tried before, go beyondÂ scrambledÂ eggs. I saw someone else in the challenge post a photo of Scotch eggs and I knew immediately this would be the perfectÂ opportunityÂ to try this odd egg. 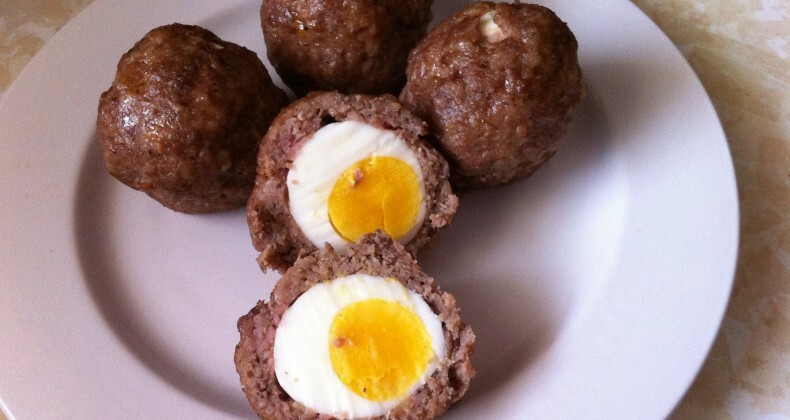 Are you familiar with scotch eggs? They are a (peeled) hard boiled egg covered in sausage then breaded and fried. They sounded delicious. A perfect breakfast food served hot with a steamy cup of coffee on a lazy weekend morning. Don’t you think? Welllllll, apparently this is not the traditional way to eat these beauties. They are typically eaten cold (shudder) with a salad. Cold hard boiled eggs I can do, but cold sausage is another story. The best part of making these at home is that you can eat them hot with a steamy cup of coffee for breakfast, if you’d like (and I do like). Since pork sausage is a little on the greasy side I opted to bake these instead of frying to save a few calories. I popped the sausage balls into a jumbo muffin tin and it worked beautifully. If frying is your thing by all means fry away! I also was concerned about my hard boiled egg being too dry after baking it, so I did a soft boiled egg instead. Divide sausage into four equal patties. 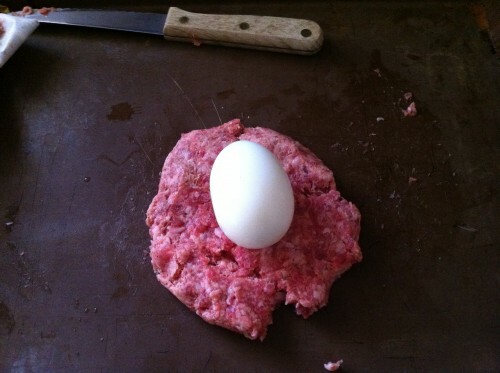 Flatten patties and place egg in the center. Wrap meat around the egg. Pressing to seal. 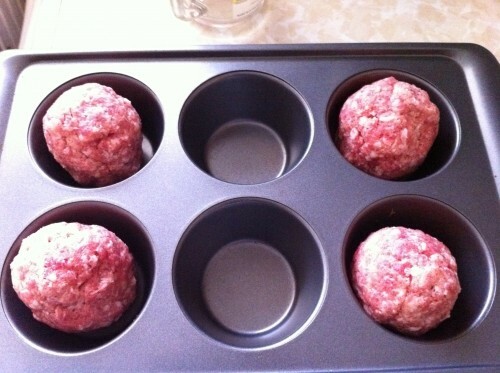 Place sausage balls into a jumbo muffin tin. Bake for 25 minutes. And enjoy hot or cold! Once the sausage is wrapped around the egg roll the sausage ball in a beaten egg, then roll in breadcrumbs. Deep fry in hot oil for for 8-10 minutes, turning frequently. Then you need to wrap in bacon!! My boys say they will be enjoying these eggs soon wrapped in turkey sausage.